Background: Diarrhea has adverse consequences for critically ill patients, health care staff, and health care costs. Objective: To evaluate the efficacy of the multispecies probiotic VSL#3 in reducing the mean number of episodes of liquid stool in enterally fed critically ill patients. Methods: A single-center, double-blind, randomized, placebo-controlled pilot study was done in a 6-bed intensive care unit in a 330-bed public hospital in Australia. A total of 45 adults (20 intervention, 25 control) who required enteral nutrition for more than 72 hours were given VSL#3 or a placebo twice daily. The frequency (mean number of episodes per patient per day) and weight (grams per day) were determined for both liquid stool and liquid and loose (unformed) stool. Results: The 2 groups of patients had no demographic or clinical differences. Patients received enteral nutrition for a mean of 8.5 days (SD, 5.4) and were studied for a mean of 11.9 days (SD, 5.6). Compared with the control group, the intervention group had a significant reduction in the frequency of liquid stools (incidence rate ratio, 0.50; 95% confidence interval, 0.27 to 0.93; P = .03). Smaller but still significant differences also occurred between the groups in both the frequency of episodes and the weight of liquid and loose (unformed) stool. 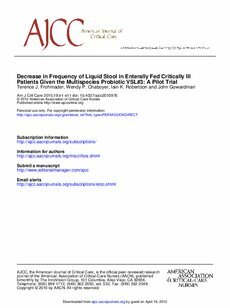 Conclusion: VSL#3 was effective in reducing the frequency of liquid stool in critically ill patients receiving enteral nutrition. Probiotics possibly can minimize diarrhea in critically ill tube-fed patients, but more controlled clinical trials are needed.